This was my first attempt at no-bake cheesecake and it turned out pretty good, but I think classic cheesecake is still my favorite. There’s just something about that dense, creamy texture that I enjoy. That being said, this would be a really good cheesecake to make in the summer when you don’t want to heat up your kitchen or when you are wanting a dessert that’s a little lighter. I have only worked with gelatin a handful of times, but don’t be intimidated. It’s not hard, just make sure you let it bloom for the full 5 minutes. I would recommend letting the cheesecake chill overnight to firm up, but I like my cheesecake really cold. 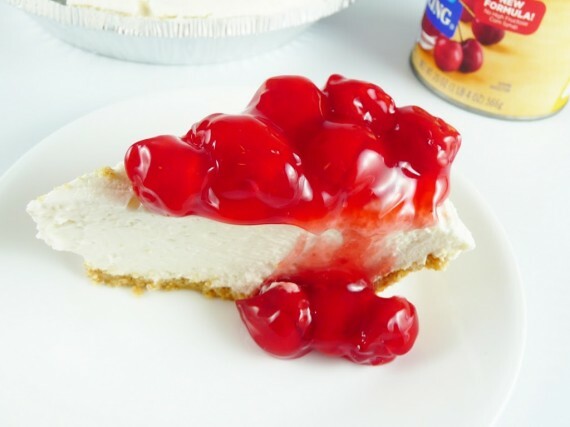 Cherries are a must for me when it comes to cheesecake, but you could certainly leave them off or top with chocolate or berries of your choice. Enjoy! 1. Mix gelatin crystals and 1/4 cup water in a small bowl and allow to bloom for 5 minutes. Heat 1/4 cup water for 30 seconds in the microwave on high and pour into the gelatin bloom. Stir to dissolve, and allow to cool. 2. Place cream cheese, granulated sugar and lemon juice In a large bowl of a stand mixer fitted with a paddle attachment (you can use a hand mixer as well). Mix on low to break down the cream cheese for 30 seconds, and increase to medium speed for another 1 minute. Scrape the sides of the bowl and add sour cream, whipping cream, and vanilla extract. Mix on medium for 30 seconds, scrape the sides, and on medium-high speed for 2 minutes, until smooth and fluffy. 3. Starting on low, pour gelatin into the cream cheese mixture. Continue to mix at medium speed for a minute, scraping the sides of the bowl after 30 seconds. 4. Pour into crust and level with a spatula. Tap pan lightly against the counter to get rid of air bubbles. Cover with plastic wrap and refrigerate for at least 3 hours, preferably overnight. Top with cherries, if desired.